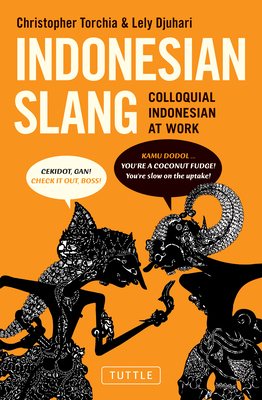 Cekidot, gan --"Check it out, Boss "
This book is an informal compendium of Indonesian expressions, including proverbs, slang, quotations and acronyms. The unique aspects of the Indonesian language offer one of the best windows into Indonesian culture. Slang, titles, proverbs, nicknames, acronyms, quotations and other expressions reveal its character, in the words of its people and are a great way to learn Indonesian culture. This book of expressions looks at Indonesia with the help of its national language, bahasa Indonesia. It describes Indonesians and their fears, beliefs, history and politics, as well as how they live, fight, grieve and laugh. Indonesian is a variant of Malay, the national language of Malaysia, and many of its expressions come from the Malay heartland of Sumatra island. Indonesian has also incorporated terms from Javanese, the language of the dominant ethnic group in a huge nation of more than 17,000 islands. Although Indonesian is officially a young language, it contains words from Sanskrit, Arabic, Chinese, Dutch, Portuguese and English, a legacy of the merchants, warriors, laborers and holy men who traveled to the archipelago over the centuries. The Indonesian language was a nationalist symbol during the campaign against Dutch rule in the 20th century. Indonesians who fought against colonialism made it the national language in their constitution when they declared independence in 1945. Two generations later, modern Indonesians loveword play. The tongue slips and skids, chopping words, piling on syllables and flipping them. Indonesians turn phrases into acronyms and construct double meanings. Their inventions reflect social trends, mock authority, or get the point across in a hurry. This book divides Indonesian expressions into categories such as food and wisdom, politics and personalities. The format is the same in each chapter. An expression in Indonesian, or sometimes a regional language in Indonesia, is followed by a translation, an interpretation of the meaning, and usually a summary of the idiom's origin or background. Some translations are more literal than others, reflecting an effort to balance clarity of meaning with the flavor of the original words. Christopher Torchia is the Turkey bureau chief for The Associated Press, based in Istanbul. He was previously posted with the AP in Singapore, South Korea, Indonesia and Colombia, as well as several U.S. cities. He is the co-author of How Koreans Talk. Lely Djuhari is a communication specialist based in Geneva, Switzerland. Prior to that, she reported on social and political issues in Indonesia, East Timor and on Indian Ocean tsunamis for Kyodo News and the AP.